I’m challenging myself to read only novels by women and femme people for a full year, from March 2019 through March 2020. Read this post to get the full story! Next up in the Women’s Book March is Night’s Gift, an indie-published novel by Camilla Ochlan and Carol E. Leever! Leever also apparently painted the delightfully old-school cover, which I’m not ashamed to admit is a big part of what made me add the book to my tottering TBR pile in the first place. I can just see finding this book in the sci-fi and fantasy section of Waldenbooks in the late nineties alongside the Tad Williamses and L.E. Modestitt Jr.’s. As for the book itself, I quite enjoyed it. Ochlan and Leever weave a swashbuckling fantasy adventure in a land brimming with strange creatures, powerful magic, rich lore… and did I mention talking cats? 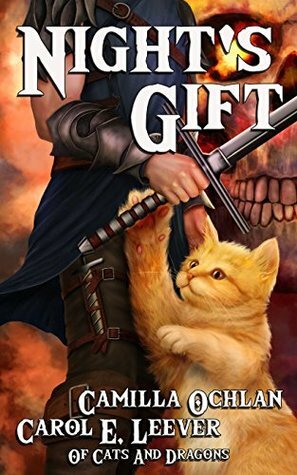 Night’s Gift is clearly inspired by D&D in its setting: the land is populated by humans, dwarves, and elves, swords and other European medieval elements are abundant, and magic is common. I have a limited tolerance for D&D motifs, yet their presence here never felt wearing, perhaps because they were well-used and never leaned on too heavily. I found a lot that was surprising here, from the richness of the descriptions (unusual in what I am guessing is a YA book, since the protagonists are in their teens), to the twists and turns as Omen and Templar navigate the Night Games, to the bits of lore the authors slip in about Hex and the wider world of the story. Tormy is a wonderful character–though a magical being, he is clearly and recognizably a cat, with catlike behaviors and impulsiveness, and I bonded to him about as quickly as Omen does. I especially liked the choice to have Tormy speak in an imperfect patois reminiscent of the lolcats meme. If you’re into fantasy YA, D&D, adventure stories, and of course, cats, check it out — I think you’ll have fun. Already read Night’s Gift? Let me know what you thought in the comments! This entry was posted in Book Reviews, Fiction, Women's Book March Challenge and tagged books, fantasy, indie, women authors. Bookmark the permalink.